Old school hip hop fans are probably fi’in to go nuts between all the great shows in the next couple months including a big one this weekend at BB King’s…. Big Daddy Kane is celebrating “20 years in the game” with the Sound Providers and Connie Price & The Keystones along with special guest DJs Mister Cee (BDK‘s original DJ), fellow Juice Crew-er Biz Markie, Skaz Digga, and J. Period. Tickets are on sale. Meanwhile, fellow Juice Crew affiliate Craig G will open for the underappreciated hip hop crew D.I.T.C. will (mostly) reunite on Dec 7th at The Knitting Factory. 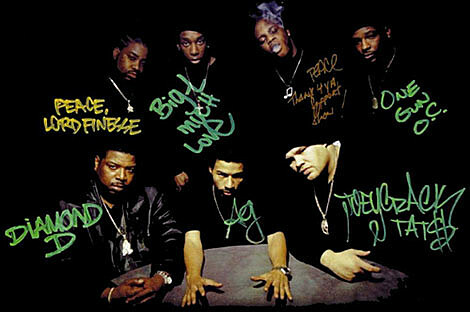 Look for Lord Finesse, Diamond D, A.G., O.C. + “special guests” to hit the main stage with The Legion. Pray that “special guests” does not mean Fat Joe. Tickets are on sale. Hiero mainstays Souls Of Mischief have scheduled their ONLY east coast show on Dec 16th at the Knitting Factory with A-Ok Collective, Tanya Morgan, Uncle Ralph McDaniels (DJ video set), Rob Flow & DJ Synapse. Tickets are on sale. 3/4 of the original X-ecutioners crew (what ever happened to Mista Sinista?) will headline a show with Sadat X (of Brand Nubian) at the Knitting Factory on Dec 10th. Tickets are on sale. Camp Lo and Jemini The Gifted One will headline The Fire Your Boss Knitting Factory finale with Marvalous, Creature w/ Rebelmatic, Elle Varner and others. Tickets are on sale. And last, but certainly not least, the last hip hop show at the Knitting Factory will be headlined on Dec 19th but none other than the god MC, aka the great Rakim Allah. Tickets are on sale.